Jason for example is a passionate fisherman. He is one of those guys who see fishing as something special, as a wonderful way to get some inner peace. In his free time, he regularly goes fishing and that is something that he really loves and enjoys doing. For today Jason has chosen a rather interesting spot for fishing. He comes for the first time to the lake named Ohrion. For him this terrain is rather unfamiliar so he decides that initially he has to explore the terrain and find the perfect spot where he could set up the hooks and start enjoying the wonderful nature. 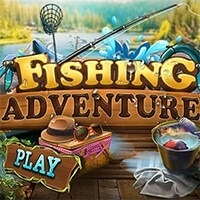 Fishing Adventure is a free online hidden object game on Hidden4Fun.